January 15, 2018 (New York City/Los Angeles) The Alliance for Women in Media Foundation (AWMF) has extended the call for entries for the 43rd annual Gracie Awards to January 25, 2018, at 11:59 p.m. Eastern in response to a high volume of requests for extensions. “Now, more than ever, we need to celebrate women for their exceptional work and contributions, especially in the media industry,” said Alliance for Women in Media Foundation Chair Sarah Foss. The Gracies recognize exemplary programming created by, for and about women in radio, television, cable and interactive media. Honorees are selected in national, local and student markets, including both commercial and non-commercial outlets. The AWMF will accept all entries submitted after the originally published deadline of January 18 through January 25 with an additional $50 late fee. Online/virtual judging will take place over a two-week period beginning the week of February 6, 2018. In-person judging will take place all day on Saturday, March 3, 2018, and the morning of Sunday, March 4, 2018, in New York City. The application deadline for eligible judges of the Gracie Awards is January 26, 2018. Qualified judges are chosen by the AWMF leadership after meeting specific published criteria. Individuals are encouraged to apply through AWMF online here. The Gracies are the largest fundraising event by the AWM Foundation, the philanthropic arm of AWM that supports educational programs, charitable activities and scholarships to benefit women in the media. Please visit http://allwomeninmedia.org/gracies/ for more information about the Gracie Awards, to submit entries and to apply to participate as a judge. About the Alliance for Women in Media Foundation: In 1960, the Alliance for Women in Media became the first professional broadcasting organization to establish an educational foundation. The Alliance for Women in Media Foundation (formerly known as The Foundation of American Women in Radio & Television) supports and promotes educational programs, charitable activities, public service campaigns and scholarships to benefit the public, the electronic media and allied fields. The Foundation also produces nationally acclaimed recognition programs, including the Gracie Awards®, a gala that honors exemplary programming created by, for or about women. The Alliance for Women in Media Foundation is a 501 (c)(3) non-profit, educational organization. For the latest news on the Gracies, follow The Gracies on Twitter and Facebook. 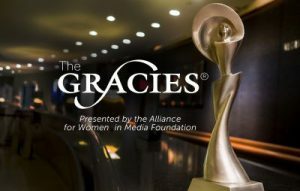 For more information about the Gracie Awards and to submit your entries, please visit www.allwomeninmedia.org/gracies. As a woman who has been in media technology for more than 25 years. I’ve seen it all. Like so many of my contemporaries and peers, we have entertaining, unbelievable, and horrific stories from our careers. IOW, #metoo. Thankfully, I found a positive outlet to drive change a decade ago when I joined the board of the Alliance for Women in Media. This organization has been recognizing amazing women breaking ceilings, instigating change, and shifting perceptions across the media landscape for more than 60 years. The founders—prominent women media professionals in the 1950s—knew they needed to create an organization to amplify our voice. And, it’s been a powerful one. The Gracies, an industry award program recognizing amazing content and talent by, for and about women, is in its 43rd year. Many of the Golden Globe honorees are also Gracies honorees; it’s truly a Who’s Who of trailblazers and rebels—a sisterhood of change agents that knew media had the opportunity to move societal progress forward. Each year, as a Gracies Judge, I’ve been able to play my part in supporting the women and men who brought these stories to listeners and viewers. Winning a Gracie has helped these story tellers and content creators hear loud and clear—“This matters! Your voice is making a difference!” It’s propelled careers and given us a way to shout “Atta Girl!” for each other when our industry didn’t. Is this “movement” or “reckoning” important? Absolutely. Is it urgent and long-overdue? Absofreakin’lutely. We as an industry have a responsibility—an obligation—to leverage our media platforms to drive progress. This is why, more than ever, The Gracies are relevant. So—here’s my ask: let’s make this Gracies a celebration of all the amazing work that women and men are doing to counterbalance the inequality and negativity. How? 1) Reach out to urge media storytellers to get involved—and submit amazing content for consideration. 3) Join AWM to bring your voice into the organization. 4) Come to the Gracies and see for yourself. There is power and R-E-S-P-E-C-T throughout our industry. I am grateful to the many fantastic women—and committed men—for making my career fun and fulfilling. I am humbled to be associated with the most amazing leaders on the AWM Board. And though I can say #metoo, I am damned proud to be a woman executive in media. And yes. I’ll be wearing my LBD this coming June at The Gracies 2018. I hope to see you there. Just when you think the events of another year would be predictable, along comes 2017. The highlights, situations and crises that unfolded over the past 365 days came at a dizzying pace. No one felt the whirlwind more than the media who brought the stories to life and in a few cases, were the story. 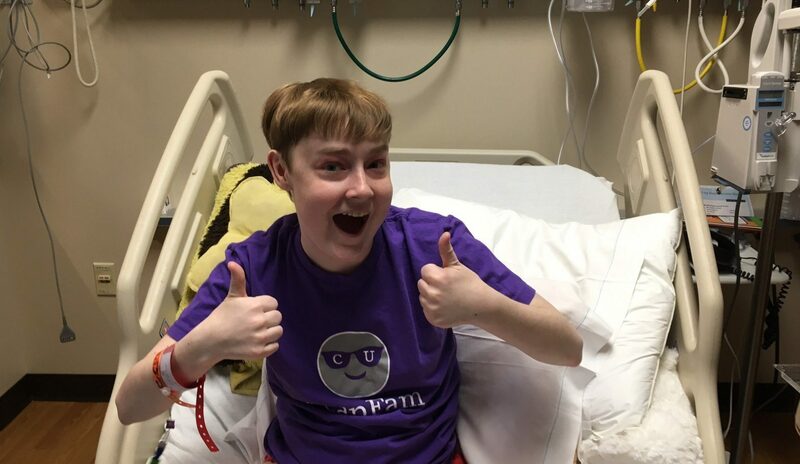 Stories of hope, tragedy and triumph have made the headlines. From the long-awaited solar eclipse where millions of people experienced a natural phenomenon through cereal boxes to anxiously awaiting the birth of April the Giraffe, to natural disasters, mass shootings, fidget spinners and countless sexual harassment allegations that have taken down some of entertainment and media’s titans. Our industry is more surprising, provocative and relevant than ever before. At every point, women in media continuously played pivotal roles in bringing these powerful issues and stories to life. We knew about these moments because of the perseverance and dedication demonstrated by you – the drivers and supporters of content through multiple mediums. For over 60 years, the Alliance for Women in Media has been supporting and celebrating the contributions of women through connections, education and storytelling. Born out of the National Association of Broadcasters, AWM (originally the American Women in Radio and Television) was created by a group of women who understood the need to connect within a male-dominated media world, so they could positively impact the future for other women in the profession. History is full of stories like these—stories of women who had the courage to step up, speak out and their actions have a lasting impact. This year highlighted the influence women continue to have in media and in workplaces everywhere. At AWM, we like to believe that our organization has been there to help those women find their voices and their important place in companies everywhere. We celebrate and salute all of you – and the men who respect, support and elevate the contributions of women in media. This includes those in front of and behind the cameras and microphones, creating environments of community and comradery. With 2018 in sight, we each can learn and grow from the lessons so apparent in the stories that captured headlines this year. Most importantly, we have an opportunity to take action by mentoring, coaching, teaching and raising other people up, while finding and navigating our own paths forward. We frequently use the phrase “now, more than ever”. As an organization and as an individual, now more than ever means so much more. Through my own personal losses this year, I will emulate my inspirational, strong-willed, wise and caring mother by being intentional in everything I do and say. As an organization, we will keenly focus on recognizing and celebrating the best programming and individual achievement by, for and about women through The Gracie Awards while adding educational content to our offering and introduce new ways to connect women (and men) in media. Here’s to welcoming a New Year and wishing the world of media a healthy, happy, productive, fun-filled 2018! 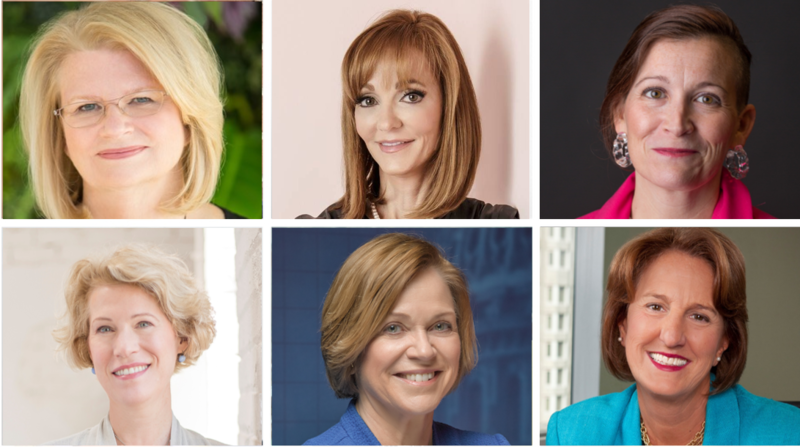 The Alliance for Women in Media (AWM) hosted its annual Women Who Lead luncheon Tuesday to a capacity crowd at the Marriott Marquis in New York City. Keynote speaker Geraldine Laybourne brought audience members to their feet as she wove current headlines of workplace harassment with poignant stories from her career. She closed her remarks by offering the rally cry “Woman up!” to reflect the great strides women have made in the industry and offer her support for continued progress. “As a mentor, as a role model, I hope that I can impact people at least a fraction of the way the women in my life have impacted me,” honoree Julie Talbott, president, Premiere Networks, told the crowd. Ms. Laybourne, a serial media entrepreneur and founder of Oxygen Media, energized the crowd, hitting on many of the most relevant touchpoints for women working across media today, often reflecting on how challenges faced today mirror those faced decades ago. But she went on to remind of the tremendous strides women have made in overcoming those obstacles and persevering to make their mark in their chosen field, as evidenced by those honored at the event that day. Looking toward continued growth and grooming of the next generation of women as media leaders, she brilliantly emphasized the importance of women mentoring and supporting women, and the need for women to have their voices and ideas heard. “If you don’t have enough glass shards in your heads yet, you haven’t broken enough glass ceilings,” she told audience members, to thunderous applause. Photos from the event can be found at https://tinyurl.com/WWL2017AWM. Sponsors of the event were Ford Motor Company, CBS Corporation, Discovery Communications, Katz Media Group, NCTA, Premiere, Scripps Networks Interactive, Refinery29, SintecMedia, vCreative and WideOrbit. Supporters were Beasley Media Group, Benztown and Mr. Master, BMI, Lerman Senter and Nielsen. November 2, 2017 (New York City/Los Angeles) – The Gracie Awards, presented by the Alliance for Women in Media Foundation (AWMF), has opened the call for entries for the 43rd Annual Gracie Awards Gala, May 22, 2018, at the Beverly Wilshire, Beverly Hills, A Four Seasons Hotel, and Gracie Awards Luncheon, June 27, 2018, in New York City at Cipriani 42nd Street. Serving again as co-chairs for the 2018 Gracie Awards are Alliance for Women in Media Foundation board members Karla Ballard Williams, Heather Cohen and Annie Howell. Vicangelo Bulluck, a seasoned veteran in awards production as well as the Executive Producer of the 2016 Democratic National Convention, has produced the Gracie Awards since 2016 and will return to produce the Gracie Awards Gala in 2018. A highlight of the 2017 Gracie Awards was honoring Ms. Debbie Allen with the Lifetime Achievement Award, presented by her “television son” actor Jesse Williams and Allen’s daughter, Vivian Nixon. 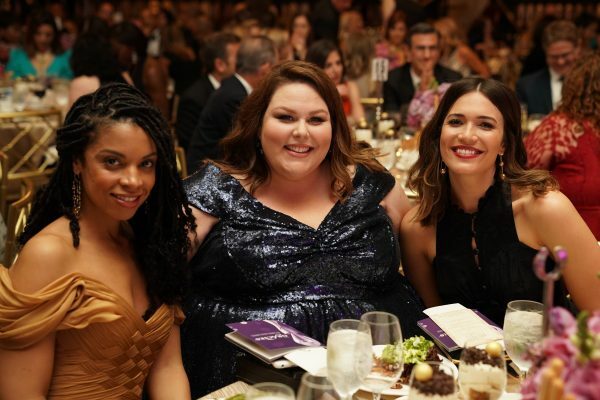 Award recipients in 2017 also included “This is Us” with cast members Mandy Moore, Chrissy Metz, and Susan Kelechi-Watson accepting, as well as Rachel Bloom, Natalie Morales, Lisa Ling, Garrett Clayton, Denise Contis and Lynn Whitfield. Presenters and additional guests included Wendi McLendon-Covey, Laura Ling, Leigh-Allyn Baker, Nischelle Turner, Debbie Matenopoulos and more. The 2018 Gracie Awards entry eligibility air dates are from January 1, 2017, through December 31, 2017. Early Bird rates for entries end on December 14, 2017, at 11:59 PM Eastern. The deadline for all entries is January 18, 2018, at 11:59 PM Eastern. Entry details including pricing, updated categories can be viewed at Gracies Call for Entries. To see more about the 2017 Gracie Awards, including the media release and past video, visit Gracies Coverage. The following essay was written by Kathryn Poe, the 2017 winner of the Loreen Arbus Scholarship. The Loreen Arbus Foundation and AWMF Scholarship provides a deserving female communications/media undergraduate or graduate student with a scholarship to their educational institution for $2,500. The world is one giant fish bowl— well, depending on who you are. We’re all trapped in our own little spaces, swimming around to the same people and faces until somebody dies. Unless someone breaks the glass, of course. Then the water goes spraying everywhere, someone gets yelled at, and we’re left flopping around on the floor. Occasionally the family cat gets to us before we can be saved. Or we get flushed. 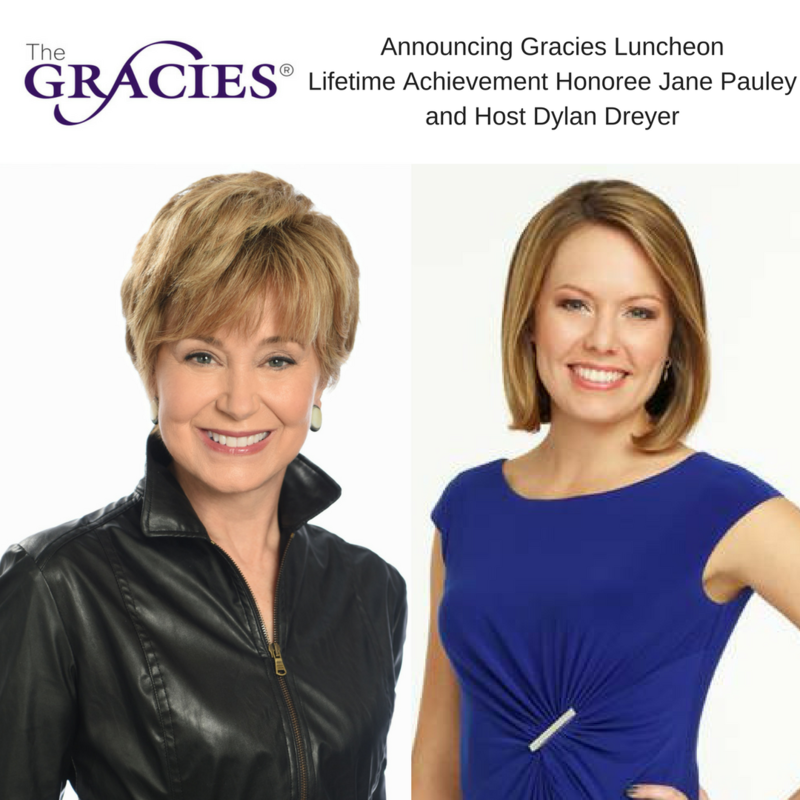 June 13, 2017 (New York City) – The Alliance for Women in Media Foundation (AWMF) is pleased to announce that Jane Pauley, journalist, author and anchor of ‘CBS Sunday Morning,’ will be honored with a Lifetime Achievement Award at the 42nd Annual Gracie Awards Luncheon. Award-winning “CBS Sunday Morning” journalist Martha Teichner will present Pauley with the award. Dylan Dreyer, weather anchor of NBC News’ “Weekend TODAY” and regular co-host for TODAY, will serve as host. This annual event, which honors the accomplishments of local and student women in media and entertainment, will take place on June 27, 2017 at Cipriani on 42nd in New York City. Pauley is an award-winning journalist and bestselling author. She was named anchor of ‘CBS Sunday Morning” in September 2016. She joined the program in 2014 as a contributor and has delivered newsmaking interviews including Condoleezza Rice, Hillary Rodham Clinton, and the only TV interview with David Letterman about his retirement from late night television. She’s also reported about a group of educators who lived through the shooting at Sandy Hook Elementary School in Newtown, Conn., now fighting to change gun control laws and an 11-year-old boy who became the voice of reason following the Ferguson, Mo. shooting. She began her network television career in 1976 as a co-host of NBC’s “Today” show. She spent 13 years on the morning broadcast, and a decade as the anchor of “Dateline NBC,” starting in 1992. She was the host of the syndicated daytime series, “The Jane Pauley Show” in 2004. Gracies Luncheon host Dylan Dreyer joined “Weekend TODAY” in 2012 from WHDH-TV, the NBC affiliate in Boston, where she served as the weekday morning meteorologist on “Today in New England” since 2007. In 2008, she was named Boston’s Best Meteorologist by Improper Bostonian magazine. Throughout the years, Dreyer has reported live for NBC News from some of history’s worst storms. Grammy-nominated songwriter Kara DioGuardi is slated to perform at the celebratory event. DioGuardi is one of the most successful contemporary songwriters in the world, with songs appearing on more than 160 million albums. A former judge on American Idol, the record EXECUTIVE and music publisher’s long list of credits include successes and collaborations with artists such as Pink, Katy Perry, Celine Dion, Kelly Clarkson, Britney Spears, Christina Aguilera, Miley Cyrus, Demi Lovato, Carrie Underwood, and many more. The Alliance for Women in Media thanks Broadcast Music, Inc.® (BMI®) for connecting The Gracies with empowering female musicians like Kara DioGuardi. The Gracie Awards, presented by the Alliance for Women in Media Foundation, acknowledge individual achievement and outstanding programming created by, for and about women in all facets of media. Celebrating more than 40 years, the Gracie Awards focus on women who are making positive change and who continue the discussion of what having a fulfilling career in media looks like. National Gracie winners were recognized at the Gracies Gala, June 6, 2017 at The Beverly Wilshire in Beverly Hills, California while local and student winners will be recognized at the Gracies Luncheon. A full list of winners can be found on the Alliance for Women in Media website. For more information about the 2017 Gracies or to secure tickets, please visit www.allwomeninmedia.org/gracies. The Alliance for Women in Media Foundation supports and promotes educational programs, charitable activities, and scholarships to benefit the public, the electronic media and allied fields. The Alliance for Women in Media Foundation has created partnerships and joint initiatives with the Emma Bowen Foundation, NCTA- The Internet and Television Association, NAB and other organizations that are philosophically aligned with the mission of the Foundation. In addition to giving almost $20,000 a year away in scholarships to deserving female students, the Foundation also produces nationally acclaimed recognition programs, including the Gracie Awards, a gala that honors exemplary programming created by, for and about women. The 42nd Gracie Awards are sponsored by the Ford Motor Company, Crown Media, CBS, 20th Century Fox Television, CNN, Katz Media Group, NBCUniversal, NCTA- The Internet and Television Association, National Geographic, NPR, Sinclair Broadcast Group, TBS, Discovery, Disney|ABC, HBO, OWN/Lionsgate, PBS/Virginia Film Office, SiriusXM, American Public Media, Cumulus and vCreative. 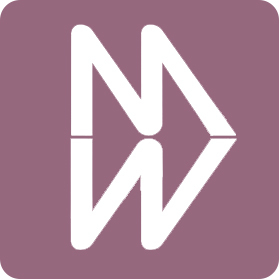 For more information about The Alliance for Women in Media please visit allwomeninmedia.org and follow them on Twitter (@AllWomeninMedia #TheGracies), Instagram (@allwomeninmedia) and Facebook . NEW YORK, June 28, 2017 – Yesterday the Alliance for Women in Media Foundation handed out the 42nd Annual Gracie Awards at a luncheon at Cipriani on 42nd in New York City. Host Dylan Dreyer led the program alongside presenters Bevy Smith from Bravo’s “Fashion Queens,” Larry Mullins from CBS Radio’s 1010 WINS, Christine Nagy from The Bob and Christine Show, and Erin Moriarty, CBS “48 Hours” correspondent. The Gracie Awards were presented to honorees which were previously announced (view full list of honorees here) in recognition of individual achievement and outstanding programming by, for and about women in local and student TV, radio and interactive media. 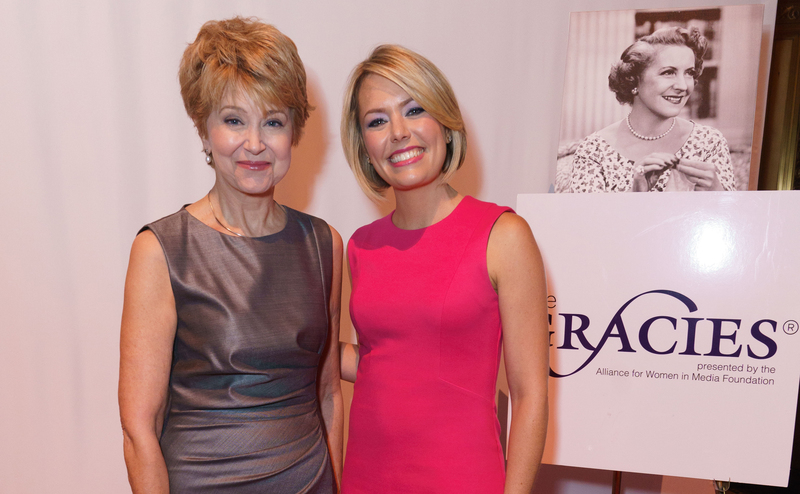 Lifetime Achievement Honoree Jane Pauley was presented her award by close friend and colleague Martha Teichner. Host Dylan Dreyer, weather anchor of NBC News’ “Weekend TODAY” and regular co-host for TODAY, opened the awards with a story of how she grew up with all brothers and wasn’t intimidated being one of two women in her meteorology program. After sharing her inspiring and personal story of beating breast cancer, songwriter Kara DioGuardi shared how she wrote the song Sober with Pink. She then performed the song as well as the Kelly Clarkson collaboration Walk Away. “Jane conducted herself in Chicago with tremendous dignity and developed a kind of respect among her peers that she has developed among her colleagues for her entire career,” said Teichner. LOS ANGELES, CA (JUNE, 7, 2017) – Last night, the Alliance for Women in Media Foundation (AWMF) handed out the 42nd Annual Gracie Awards to a packed house at the Beverly Wilshire Hotel in Beverly Hills, Calif. First-time host Jeannie Mai led the show with exuberant energy and Gracies Impact Award recipient Rachel Platten treated attendees to a stellar performance. The Gracie Awards, which each year celebrate female luminaries on and off the screen for outstanding achievements across radio, television, cable and interactive media, hosted award recipients such as Lifetime Achievement Honoree Debbie Allen, Rachel Bloom, “This is Us” cast members Mandy Moore, Chrissy Metz, Susan Kelechi-Watson, as well as Natalie Morales, Lisa Ling, Dove Cameron, Garrett Clayton and Lynn Whitfield. Presenters and additional guests included Jesse Williams, Wendi McLendon-Covey, Laura Ling, Leigh-Allyn Baker, Nischelle Turner, Debbie Matenopoulos, Vivian Nixon, and more. This year’s social ambassador was Jillian Rose Reed and the ceremony was executive produced by Vicangelo Bulluck. The complete list of previously announced honorees can be found here. Actress Donna Lynne Champlin received the first award of the evening for her supporting role in “Crazy Ex-Girlfriend” and gave an acceptance speech that had co-star Rachel Bloom in the audience in tears. “I would like to accept this award on behalf of all the women who have been told they’re too fat, too old, or too ugly to be on television,” said Lynne Champlin as she received a standing ovation. Co-creator, writer, and star of “Crazy Ex-Girlfriend” Rachel Bloom presented the award for Best Drama to the cast of “This Is Us,” which was accepted by Mandy Moore, Chrissy Metz, Susan Kelechi Watson, and executive producer Jess Rosenthal. Debbie Allen was presented with the night’s top honor, the Gracies Lifetime Achievement Award, by actor Jesse Williams and daughter Vivian Nixon. “This is a time for women to speak up loudly and to stand tall. I truly am honored as is my family and my own tribe. Thank you for continuing to inspire us to honor ourselves,” said Allen.